Peterbilt Motors Company has expanded its refuse truck line-up with the new Model 520 featuring new seating configurations for route collection versatility, enhanced styling and availability of the PACCAR MX-11 engine. 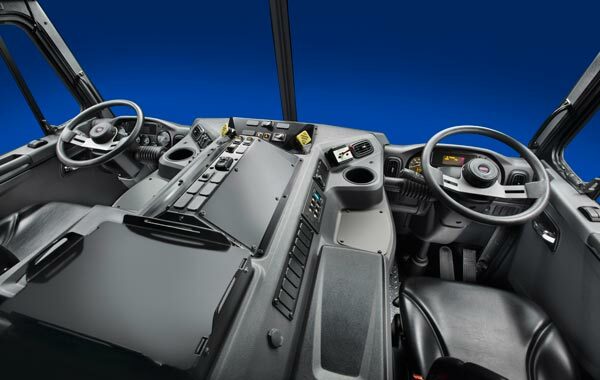 The dual-station cab has two nearly identical work environments so drivers can seamlessly and safely operate from the left- or right-hand side, including dual controls for the parking brakes, HVAC system and stereo. The console sides are angled to give operators easy visibility and access to the same controls and displays from the right and left. The cab also features an enhanced HVAC system for improved airflow and climate control. “Peterbilt continues to improve the popular ProBilt interior that is ideally suited for vocational applications,” said Scott Newhouse, Peterbilt Chief Engineer. “The Model 520 features Peterbilt’s latest ProBilt design, providing an operating environment that optimizes comfort, ergonomics and productivity.” The Model 520’s distinguished grille styling accommodates pantograph wipers that cover 27 percent more of the windshield than previous designs for increased safety during inclement weather. Two headlight technologies are available for the Model 520, optional LED lamps and standard single halogen bulb lamps. Both provide long service and outstanding brightness and coverage. The Model 520 is available with more power options and higher horsepower and torque than any competitive refuse collection vehicle. It is available with the PACCAR MX-11 engine which went into production earlier this year. “The PACCAR MX-11 engine provides outstanding value in a lightweight and fuel efficient design,” Newhouse said. It is available with up to 430 horsepower and 1,550 lb.-ft. of torque. The Model 520 can also be powered by natural gas with both 9- and 11-liter engine options available. 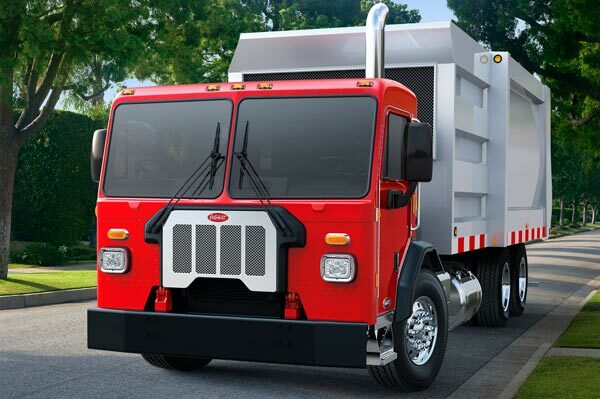 “The Model 520 is the foundation of Peterbilt refuse collection vehicles,” said Siver. “Peterbilt’s Model 520 will give our refuse customers unprecedented levels of uptime, productivity, driver satisfaction and low cost of operation.” Peterbilt Motors Company, located in Denton, Texas, has a global reputation for superior quality, industry leading design, innovative engineering and fuel efficient solutions, and is recognized as the “Class” of the industry. Peterbilt provides a comprehensive array of aftermarket support programs through its 300-plus North American dealer locations that complement its full line-up of on-highway, vocational and medium duty products, including alternative fuel vehicles. Peterbilt offers industry leading service and support, including SmartLINQ remote diagnostics, preventive maintenance plans, expedited Rapid Check diagnostic services, automated parts inventory replenishment and 24/7 with complimentary Customer Assistance.